Help a businessman in Vivec squash some local competition. Talk to Alusaron in his shop on the Plaza of the Foreign Quarter. Steal a contract from Ralen Tilvur. Return to Alusaron for the reward, a Firebite War Axe. Talk to Alusaron in Vivec, Foreign Quarter Plaza. He will complain about the amount of competition he's facing and especially about losing a good deal of business to Ralen Tilvur. Alusaron has heard that Ralen Tilvur has recently received a contract for a large weapons shipment. He asks you to steal the contract from Ralen Tilvur. The contract can be found in Ralen Tilvur's private quarters (Foreign Quarter Plaza) and is protected by nothing more than a door with a lock level of thirty. 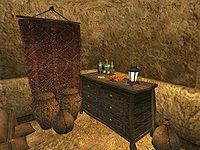 If you are having difficulty picking the lock without Ralen Tilvur seeing you, you can position yourself in front of the shelf closest to the door to block his view, or use magic to open the door instead. Bring back the contract to Alusaron and he will reward you with a Firebite War Axe. 10 I've heard rumors that Alusaron, a smith in the Foreign Quarter of Vivec, has been losing a lot of business, and his nearest competitor recently got a big contract. 15 Alusaron has been having some problems of late with his shop. He has been losing a good deal of business to Ralen Tilvur, a competing smith in the Foreign Quarter of Vivec. 20 Alusaron has heard that Tilvur has recently received a contract for a large weapons shipment. He would like me to steal this contract, with the hopes that Tilvur will be unable to fulfill his order. In the meantime, Alusaron will be prepared to fulfill the order on time. 30 I've agreed to steal the contract from Tilvur's shop. Alusaron figures he has it locked away in his private quarters, but does not believe it will be well guarded. 40 Finishes quest I have told Alusaron I will not steal the contract from Ralen Tilvur. 50 Finishes quest I returned to Alusaron's shop with the contract he asked me to steal for him. He was happy with my performance, and has rewarded me with an axe he has crafted.